The Panavia Aircraft is a multinational company established in 1968 by the British BAC (British Aircraft Corporation), German MBB (Messerschmitt-Bölkow-Blohm), Italian Fiat Aviazione and the Dutch VFW-Fokker. The involved companies’ mutual agreement resulted in a joint venture project of a new fighter-bomber aircraft. Initially, two versions were planned: the single seat Panavia 100 for Germany and Italy, as well as the twin seat Panavia 200 for the Great Britain and the ­German Navy Air Force. 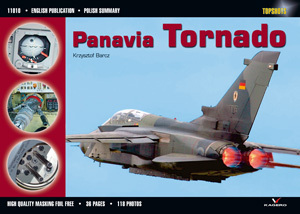 In a similar arrangement, development of the Tornado’s turbofans was undertaken by three partners of the MCRA (Multi Role Combat Aircraft) project: Rolls-Royce, German MTU and Fiat. Shortly afterwards, Netherlands left the project. The design took a long time to develop, since the aircraft’s performance was to meet particularly high standards, duly expected of a modern combat aircraft. The experiences of the Vietnam and Afghan wars led the engineers and designers alike to the conclusion that such electronically advanced avionics demanded a two-member crew. Hence, the single seat Panavia 100 project was dropped. The prototype was first flew on 14th August 1974. The first flight tests proved satisfactory. The new design also passed the weapons handling trials as well as the speed tests, during which the P-01 prototype had reached the speed of 2 Mach. The prototypes P-01 through P-12 were further tested until 1979. The prototypes designated P‑13, P-14 and P-15 served as blueprints for each cooperative nation’s own serial production. 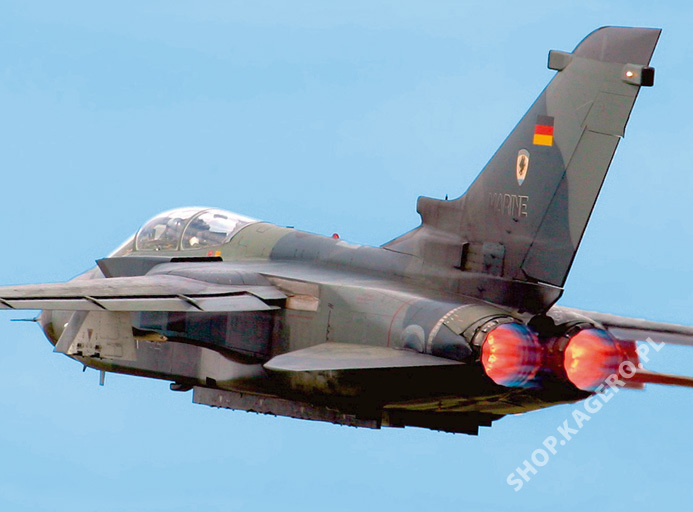 As the aircraft’s name – Tornado – was commonly accepted, the mass production commenced in 1979. Deliveries to combat units followed in the spring of 1980. Overall, RAF was issued 229 Tornados in IDS (Interdictor/Strike) variant (GR1 and GR1A), Germany another 324 (including 112 for their Navy Air Force), and Italians 100. Further 48 aircraft were purchased by the Saudi Arabia, while eight found their way to Oman. Tornado went through its baptism of fire during the first war in Iraq, in January 1991. The aircraft was also deployed in numbers during the conflict in Bosnia and the second war in the Persian Gulf, in 2002. The aircraft proved its worth as the tactical support machine, capable of engaging and destroying targets with very high ­accuracy. The Tornado’s terrain-following radar allows a hands-off stealthy approach to a target while flying at extremely low level at high speed. Suitably upgraded and overhauled, the Tornados are expected to remain in the first line until 2020..